Facebook is testing a “buy” button that lets users make purchases directly from their news feeds. A limited number of small and medium-sized businesses in the U.S. are involved in the test, with the e-commerce feature available to users in Facebook’s desktop and mobile versions. A participating businesses’ ads include a “buy” button to purchase the item being advertised, without leaving Facebook’s site. 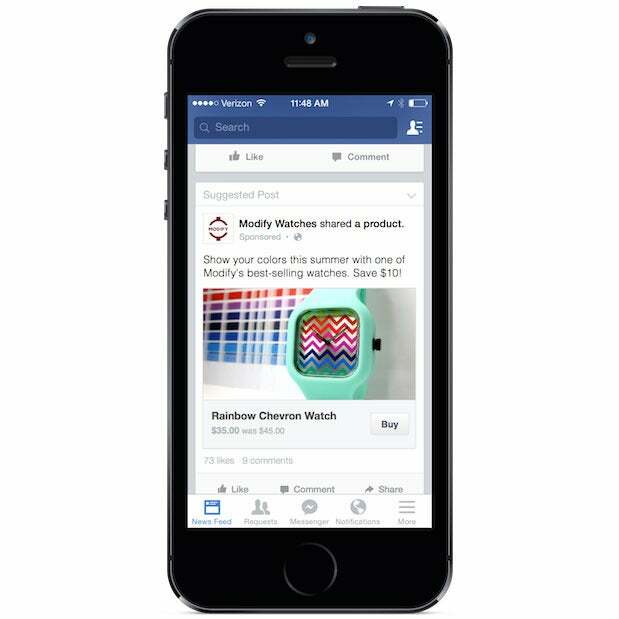 Facebook is showing an ad for Modify Watches, with a button to buy one of its mix-and-match watches, in a blog post providing information on the test. The new Facebook "Buy" button. Should the feature launch more broadly, it could help Facebook attract new businesses and further grow its already lucrative advertising sales. Facebook users, however, would have to be comfortable sharing their payment information with the social network. Facebook said it built the feature with privacy in mind and will not share credit or debit card information with other advertisers. Users can choose whether they want to save their payment information with Facebook for future purchases. Facebook’s test of the feature follows the company’s hiring of former PayPal president David Marcus to head mobile messaging efforts, aimed at the development of new features. Facebook’s API (application programming interface) lets people make payments through third-party apps, often for virtual goods. Facebook tried a physical gift selling service, but that was abandoned last year. Twitter is also said to be developing an e-commerce service.